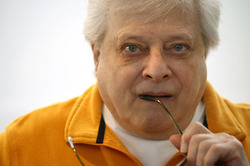 Harlan Ellison is an American writer. His principal genre is speculative fiction. His published works include over 1,700 short stories, novellas, screenplays, teleplays, essays, a wide range of criticism covering literature, film, television, and print media. He was editor and anthologist for two ground-breaking science fiction anthologies, Dangerous Visions and Again, Dangerous Visions. Ellison has won numerous awards including multiple Hugos, Nebulas and Edgars.